Oh so simple, and tastes just lovely – so smooth and with a lemony zing. This is a really quick yet impressive dish to make – and the parmesan crisps are just divine – lucky I didn’t make too many of them, or I’d have eaten them all without a second thought! This recipe is from Udaysen Mohite, who is the Executive Chef at the Brisbane Hilton. My parents came over for dinner last night and I wanted to make something from “In The Mix” because I’ve been very slack the last couple of weeks – blame school holidays and a very ill little man, and I was getting antsy. I had a thermo itch to scratch, so not only did I make this soup, but also adapted a recipe I saw in yesterday’s Melbourne Age Good Weekend supplement for Neil Perry’s Coconut and Pineapple Pannacotta – which was lovely – I’m happy to email my thermo-adaptation of the recipe if anyone wants it. 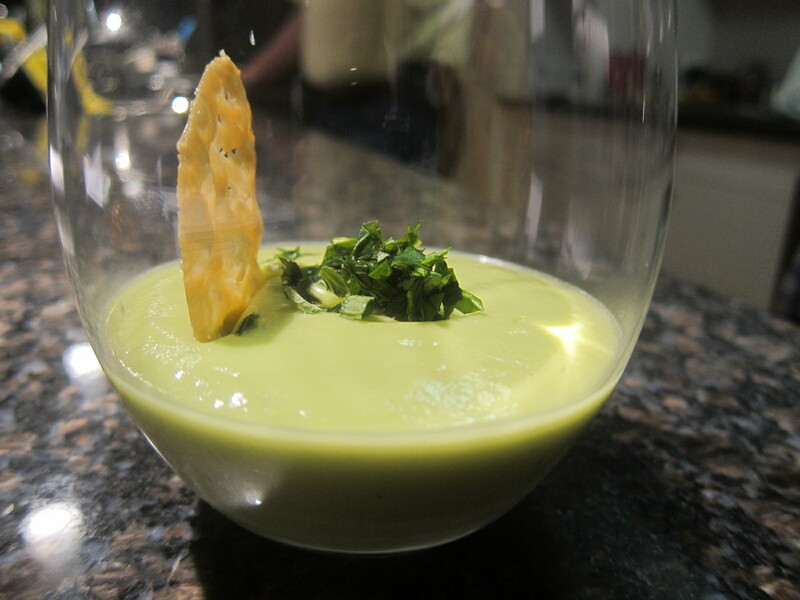 The chilled Mint and Avocado soup is really easy to make. And super quick if you already have a batch of vegetable stock concentrate in your fridge – which I suspect most thermomix fans do. Making my own stock concentrate was one of the reasons I bought my thermomix – I used to regularly spend $15 a week buying liquid stock for soups that I made while I was studying part time and working full time…I think I probably wouldn’t have spent $15 in total on bought stock in the years since – and I bet the batches of stock I’ve made probably would figure out at about $15 in total! Anyway, I digress. If you haven’t made the stock concentrate before, you’d need to do that before you made the soup, or be a cheat and buy some liquid stock from the supermarket. 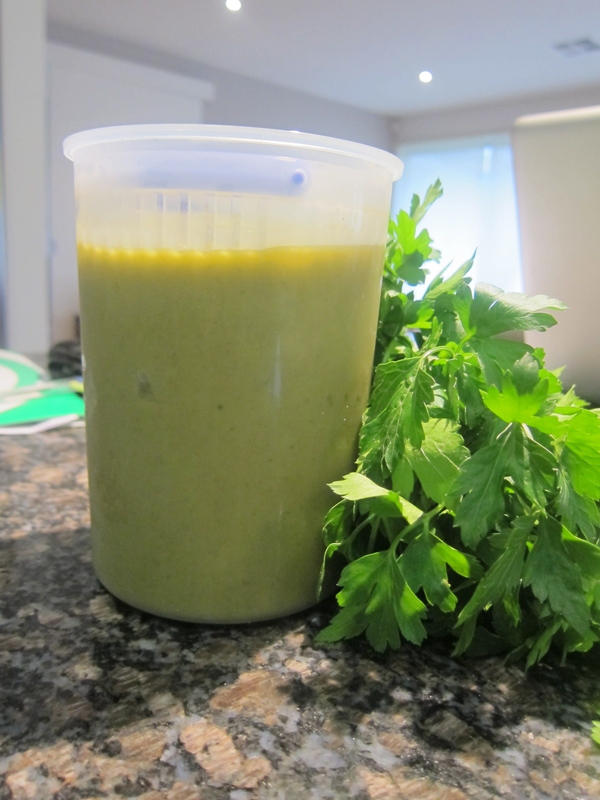 I have used both the standard thermomix stock concentrate recipe from the Everyday Cookbook and Dani’s version, and I must admit I much prefer the flavours in Dani’s version. I used to keep my stock concentrate in a glass preserving jar, but I had noticed that the metal clasp was starting to get a little coroded from all the salt, and a few weeks ago at the supermarket, I happened upon a “Sistema” plastic container that works a treat and holds a while batch of stock without a problem. First off, you need to make the parmesan crisps – and boy, are they crisp! I am not known for my precise knife work, and to get the parmesan cut nice and evenly, I used the mandolin slicer. I used the thinnest setting, and put the slices on silicon paper and baked them. They took about 20 minutes at 150 degrees, but I am sure it will depend on your oven, so do keep an eye on them. I let them cool on the baking paper for about 10 minutes, and then just lifted them off and put them onto some kitchen paper to soak up any oil. Most of the oil was left on the silicon paper anyway, but you wouldn’t want to not take them off the silicon paper as I bet they wouldn’t crisp up as well. 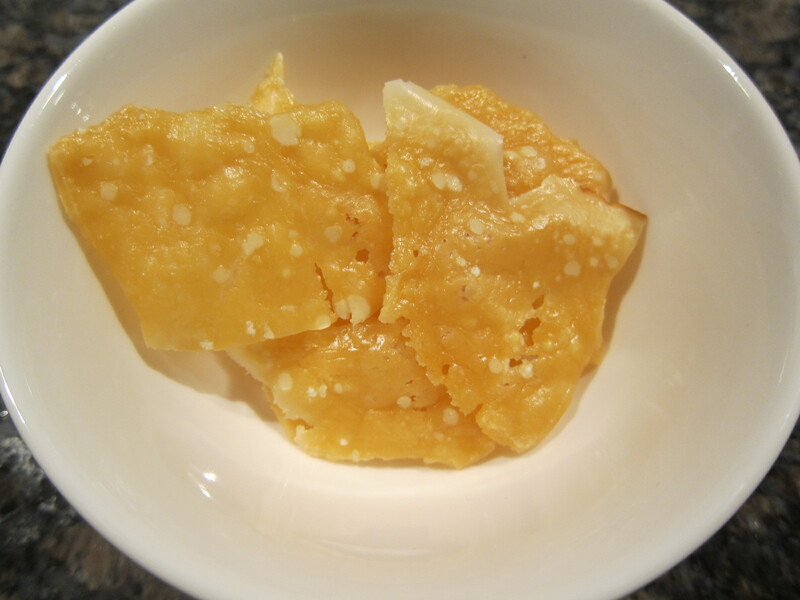 The resulting crisps are absolutely beautiful, wafer thin, crunchy and of course taste amazing – but make sure you use a really good parmesan for them. I made these several hours earlier than I needed them, and they showed no sign of going limp when I served them up, so you could easily make these the morning you’re planning to serve the soup. If there were any left, I could tell you how they are the following day, but – they are so good – there are none left!! What could be easier than peeling and stoning just three avocados? Not much – but it does get down to the selection of your avocados – you need to select the ones that are just ripe. I was lucky and got three perfect ones with no bruises or blemishes. I erred on the side of caution and didn’t make the soup until about an hour before I was planning to serve it, because I was a little worried that the avocado might go that icky dark colour if I made it too early. There is lemon juice in the recipe, and I thought that might help the discolouration factor, and to be honest, there was no discolouration at all in the hour or so it was in the fridge waiting to be served up. I was doubly cautious though and put one of the stones in the mixture while it was in the fridge, I’m never sure if that’s an old wives’ tale or not – but you never know!! The mint component of this dish is really minimal, and to be honest, more decorative than anything else – just a couple of mint leaves on top to serve. I didn’t check the bunch of mint I bought and the leaves were all ginormous, so I ended up finely chopping it and making a little pile of it. 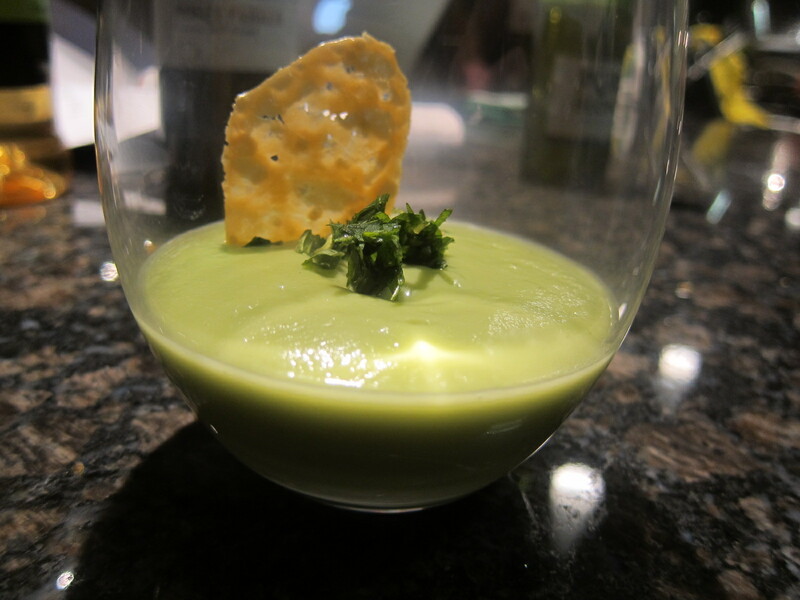 You could probably even use some lemon rind, chives, or even some micro herbs for added effect and taste. As for the seasoning, I was pretty heavy handed with the white pepper and salt, and ended up adding some more black pepper as I was eating it – it was delightful – and so popular with the four of us that we even ate the leftovers, and then proceeded to main course and desert!